For 50 years the “Freedom Tree” has been an icon at the end of 4th street, protecting Tubbs Hill from development, marking the beginning of open space to the waterfront and commemorating a Vietnam war veteran. 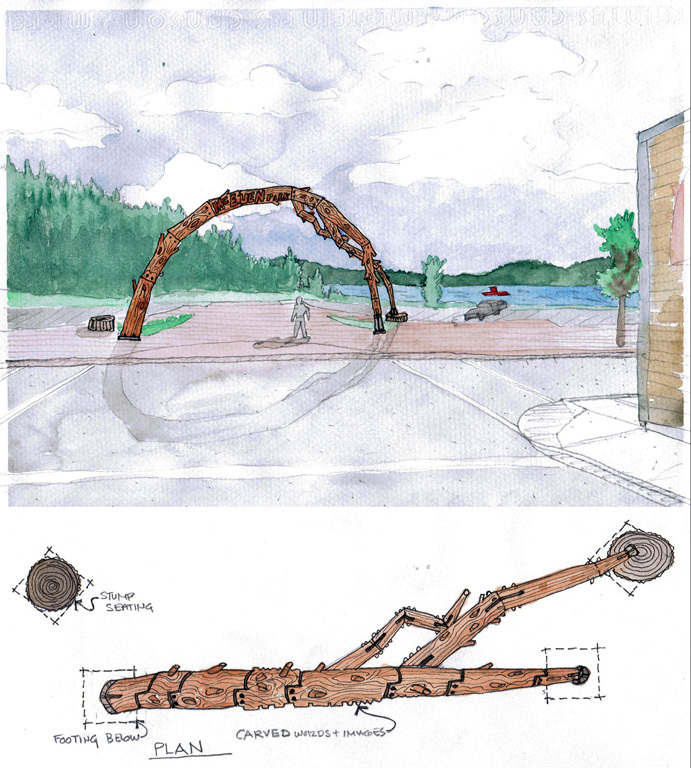 With the redevelopment of McEuen Park we proposed to re-purpose cut segments of the 65 ft. freedom tree into a an arch that celebrates entry while echoing the presence of the iconic Norwegian Spruce. 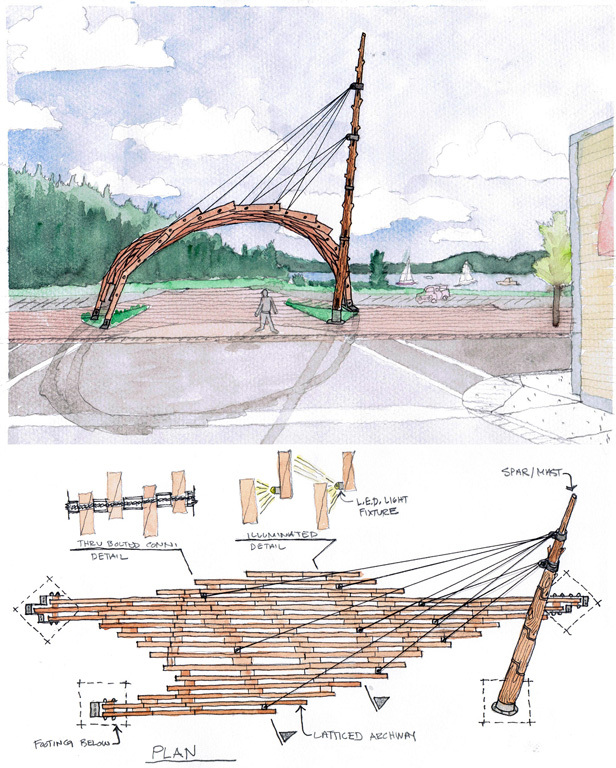 Spar Mast scheme: is inspired by the regional tradition of High Lead Logging in the Pacific Northwest. The vertical spar, comprised of discrete pieces joined by traditional timber framing methods, acts as the primary structural member while pointing to Lake Coeur d’Alene. As in High Lead Logging, the spar supports a field of timber pieces. The latticed arch is primarily supported by a network of stainless steel cables; the space between lattice members provides an opportunity for lighting. Floating Arc scheme: rises from the ground on a solid base, establishing a strong presence for the lightweight tensile structure that springs overhead. Its canopy is composed of carved and peeled logs with sleek stainless steel cables. The open structure floats above the promenade inviting visitors to McEuen Park while framing Tubbs Hill and the surrounding landscape. Tree Arch scheme: reconfigures segments of the freedom tree into a branching archway. 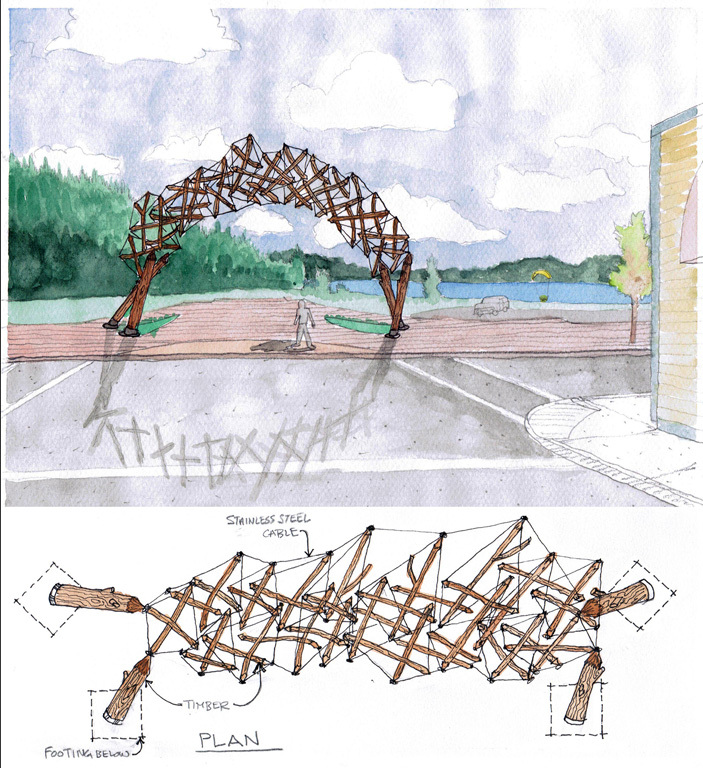 Using solid members in a traditional compressive structural system, the archway would utilize traditional timber framing and exposed knife plate bolted details. Trunk segments could be carved with words and images (park name, past/present/future images) to further articulate its connection with the Coeur d’Alene area. The Tree Arch, rendered here as freedom tree segments, could also make use of other timber products in both peeled and milled form.